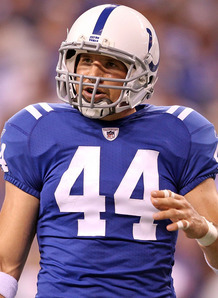 Indianapolis Colts tight end Dallas Clark has been ruled out for the rest of the season after learning he needs surgery on a wrist injury. Clark is considered one of the NFL’s elite tight ends and recorded a career-high 100 receptions for 1,106 yards in the 2009 campaign. He was on his way to another productive season having caught 37 passes for 347 yards and three touchdowns in the first six games before picking up the injury. But the Pro-Bowler will be unable to add to those statistics after being put on the injured reserve list, leaving quarterback Peyton Manning without one of his go-to options. “It’s unfortunate but it’s been confirmed that surgery is necessary,” Clark told the Colts’ official website. Indianapolis wide receiver Austin Collie is also set for an indefinite spell on the sidelines after undergoing thumb surgery. Colts star wideout Reggie Wayne currently leads the league with 45 receptions and ranks second in receiving yards (602). England will now almost certainly have to beat tournament favorites Australia in Melbourne next weekend to keep alive their hopes of reaching the final on November 6. There were some promising signs for a young England side after they were completely outplayed in the opening 40 minutes. The visitors improved markedly after the break and probably had the better of the second half, but after the video referee harshly ruled out Kevin Brown’s try that would have got England to within four points, their challenge fizzled out. Giant Kiwi winger Manu Vatuvei’s tournament ended inside two minutes after he fractured his arm in a collision before he had even touched the ball, but he had barely left the field before his side went ahead. The recalled Stuart Fielden conceded a penalty for a high shot and a brilliant long pass by his Wigan teammate Thomas Leuluai put Junior Sa’u in at the corner. Skipper Benji Marshall missed the conversion but the Kiwis were under way. England looked nervy and were struggling to retain possession, hardly the ideal combination against a New Zealand side brimming with confidence, pace and attacking intent. On 16 minutes James Roby lost the ball attempting an offload and after England deliberately slowed the play in front of their own line, Marshall knocked over a penalty to stretch the lead. It took 20 minutes for England to mount an attack of note, but it broke down in the final quarter as Sam Tomkins was pinged for a forward pass. But after Sam Burgess knocked on, England were lucky to escape when Simon Mannering’s try was ruled out for a pass that looked equally marginal.